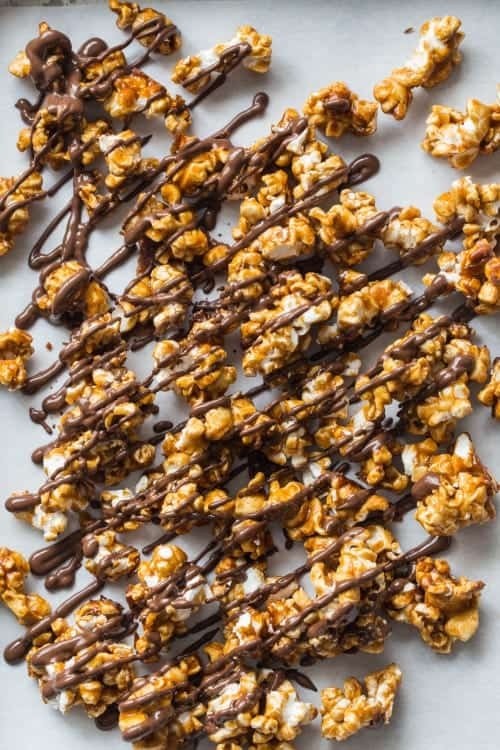 Autumn Spiced Caramel Corn is loaded with pumpkin pie spice and drizzled with dark candy melts to create a delicious and addictive snack that is perfect for the holiday season. This is a sponsored post written by me on behalf of Ghirardelli®. If you follow along with My Baking Addiction on a regular basis, you may be aware that my friend Emily and I had a whirlwind of a trip to New York City. We went to bake live in the Bon Appetit kitchen alongside their executive chef, Mary Nolan. Emily and I created and photographed seven recipes for Ghirardelli. And then we went and shared them in a (completely terrifying) live stream event! Although the trip was super short, we had an amazing time surrounded by an incredible of team of enthusiastic, smart, witty and talented people. People that pushed us out of our comfort zones and made us feel at home at the same time. And for this anxiety-ridden girl, that’s no easy task! Even though Emily and I both approached the live Bon Appetit event with much trepidation and anxiety – we walked away with a sense of accomplishment. After all, my only goals were to not cuss (I tend to do so when I’m nervous) or stare blankly into a camera while repeating the word umm. I’m pretty sure I said um a few times, but cuss – I did not. Total win in my book. Among the recipes that we made during the live stream event is this Autumn Spice Caramel Corn. 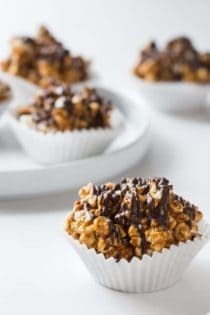 It’s loaded with pumpkin pie spice and drizzled with Ghirardelli Dark Candy Melts to create a completely addictive snack. It’s perfect for the holiday season! This was definitely one of the most loved recipes that we created – seriously, people couldn’t get enough of the stuff. When Emily and I photographed this recipe, we portioned it into individual cups which makes it perfect to display on a festive platter as a grab-and-go snack for any holiday party. If you’re looking for more scrumptious and festive holiday recipes, be sure to head over to Ghirardelli’s website and check out their Small Bites recipe selection. Emily (Jelly Toast) and I teamed up to create and photograph a variety of incredible recipes like these Mini Chocolate Raspberry Trifles just in time for the holidays! Stay tuned to MBA over the month or so for more holiday inspired desserts. 1. Preheat oven to 300° F. Line two large baking sheets with parchment paper; set aside. Pour popped popcorn into an extra large bowl. 2. In a medium saucepan over medium-high heat, combine butter, brown sugar, corn syrup, molasses and pumpkin pie spice. Bring mixture to a boil. Boil for 4 minutes without stirring. Remove pan from heat and stir in vanilla and baking soda. Immediately pour caramel sauce over the popcorn and stir to evenly coat the popcorn. If desired, stir in pecans. 3. Pour caramel corn onto prepared baking sheets and spread into an even layer with a rubber spatula. Bake in preheated oven for 30 minutes, stirring every 10 minutes. 4. Allow caramel corn to cool completely. Melt Ghirardelli Dark Melting Wafers according to package directions and drizzle candy coating over cooled caramel corn. 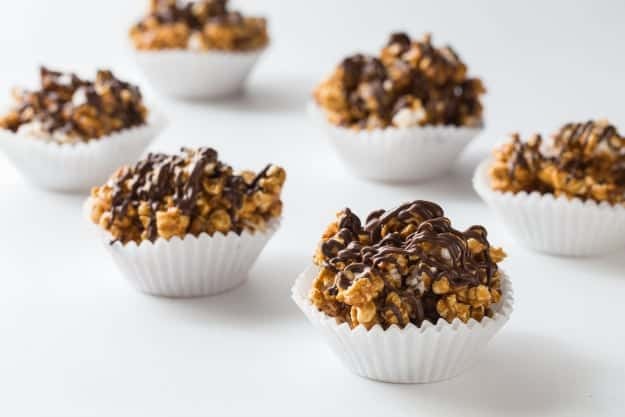 Allow candy coating to set and break caramel corn into pieces before serving. Disclosure: This post is sponsored by Ghirardelli®; however, the views and opinions expressed on My Baking Addiction are my own, and based upon my experiences with Ghirardelli® products. Thank you for supporting Ghirardelli® and the brands that continue to make My Baking Addiction possible. Yum – I love caramel corn. I will definitely try your recipe. Thanks, Sarah! It is so darn delicious! Thanks for stopping by, Brendon! This corn looks like such a nice snack! Love it! Yummy! I love the individual cups idea! Thanks so much, Tori! :) Have a great week! This caramel corn is fall perfection! I love the autumn spices and that chocolate drizzle. I totally agree, Jen! And it’s so darn delicious! Not only does that sound amazing but looks totally gorgeous, too! The overhead shot is killing me.. so elegant! Thanks so much, Cheryl! I appreciate you stopping by and your kind words. It sounds like you had such a fantastic time in New York City! This caramel corn looks like PERFECTION. Pinning! We did! Thanks so much for stopping by, Abbie! Can I use microwave popcorn without the butter flavoring?